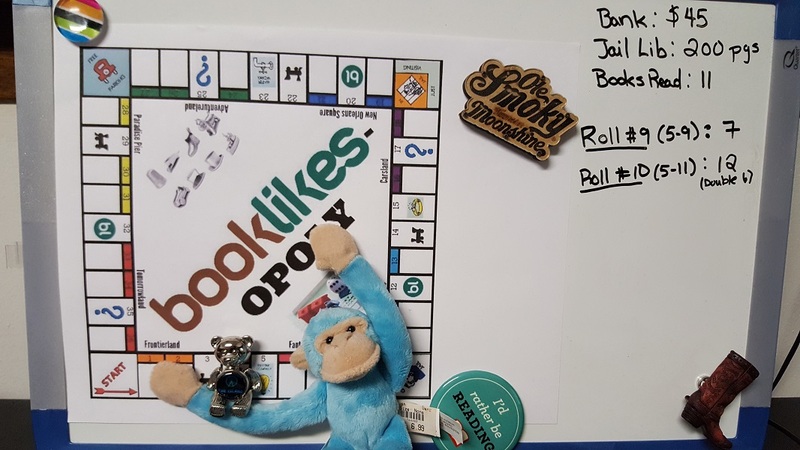 Ani's Book Abyss: Booklikes-opoly | Roll #10! My Roll #9 yielded a seven, moving my from Water Works to The Monorail (29). I chose to read The Thing About Love by Julie James, which featured both travel by air (the characters fly to Jacksonville from Chicago a few times), as well as took place in Chicago, a city with a subway system. This book was 380 pages, worth $3.00, which brings my Running Bank Total to $45.00. Rolling a Double 6, I moved from The Monorail (29) to Frontierland 4. First of all, I'm a little sad, because I think Teddy Bear's magnet isn't holding very well at certain spots on the board, specifically the spots on the board that I need him to stay. So Magnetic Monkey is here to save the day again, lending a hand... or an arm, I suppose. Thank you, Monkey! From Frontierland 4, I moved 4 spaces and landed on Mystery Square 8. 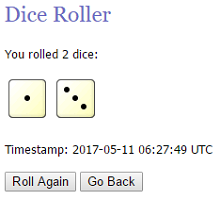 Okay, we're both excited that I landed on a very ideal square, one I landed on for my very first roll of the game, which is great! But Monkey, maybe tone it down a little bit? 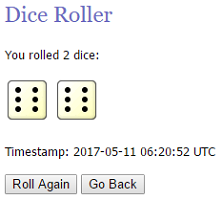 Anyway, it looks like double rolls pop up a lot in this game as I've been seeing a lot of them. But in this case, I'm extremely happy with my luck. I was trying to figure out what to do for the weekend when I will be out of town and possibly unable to roll... or if I DO roll, I may be unable to access my board and my photo sources to post my roll update. Rolling a double will allow me the chance to choose two books to read for BL-opoly. 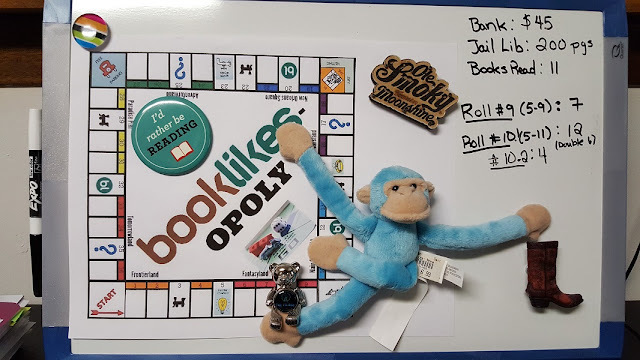 So even if I won't be able to roll again in 48 hours, I'll still have books to read for BL-opoly that will keep me busy over the weekend until I get home. 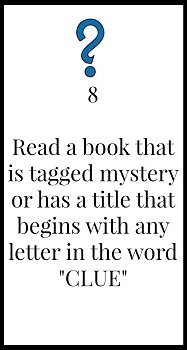 Although, while I'm ecstatic about Mystery Square 8 (there are SO many books I can choose from! ), Frontierland 4 may be a bit harder to figure out. 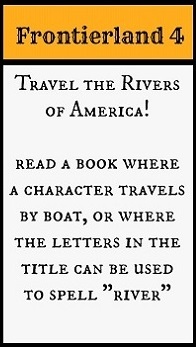 For Frontierland 4, I went the easy route and just looked for books whose titles' letters can be used to spell "RIVER," because knowing which books feature characters traveling by boat wasn't going to be an easy one to figure out. 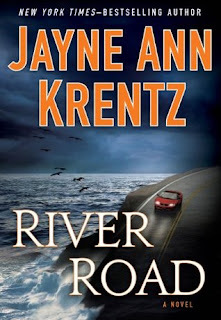 River Road by Jayne Ann Krentz -- The Kindle edition as a library check out shows that it is 353 pages, which is worth $3.00. 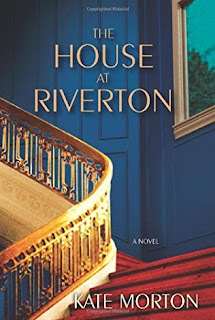 The House At Riverton by Kate Morton -- If I pick up the hardback copy from the library, it will be 476 pages, as listed on the library's website; or I could read the Scribd version at 480 pages; either way it will be worth $5.00. 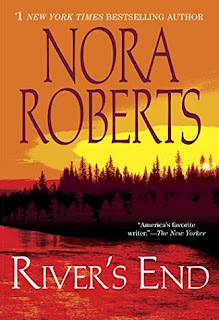 River's End by Nora Roberts -- The Kindle edition as a library check out shows that it is 447 pages, which is worth $5.00. I like both Jayne Ann Krentz and Nora Roberts, so it's a hard decision to make. I've never read Kate Morton, but she's been on my radar for the longest time and The House at Riverton, which I believe is her debut novel, sounds very interesting and has lots of good reviews. I feel like I'm going to have to roll another set of dice or something or ask for a vote. Meanwhile, for Mystery Square 8, I already have several books that would fit this one, specifically books that are already on my TBR. The following are the ones I'm intent on reading, but once again, it's so hard to choose without flipping a coin or something, y'know. 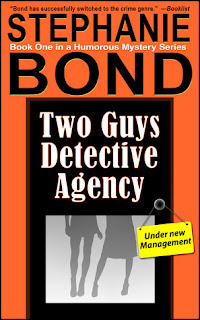 Two Guys Detective Agency by Stephanie Bond -- A cozy mystery. I would be reading the Scribd e-book version which is 255 pages, worth $3.00. 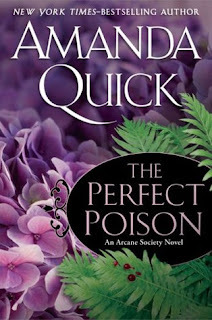 The Perfect Poison by Amanda Quick -- A historical mystery. I would be reading the library e-book version via Kindle books, which is 364 pages, worth $3.00.